Just one day remains as far as the summer is concerned at the 2014 World Series of Poker, as the Main Event has now reached the final 27 players — all that’s left from the 6,683 hopefuls who began poker’s most prestigious event a week ago. Day 6 was a long one, taking 11 hours to play down from 79 to 27, and when the bagging commenced it was end-of-Day-1a leader Martin Jacobson of Stockholm, Sweden who had collected the most chips with 22,335,000. The chase pack to begin play Monday will include Luis Velador (16,600,000), Dan Sindelar (16,345,000), Andoni Larrabe (15,280,000), and William Pappaconstantinou (14,640,000). Last year’s ninth-place finisher Mark Newhouse survived the night in 11th position (6,820,000), thus keeping alive his quest to become the first player to make back-to-back WSOP Main Event final tables since Dan Harrington did it in 2003 and 2004. Bryan Devonshire (14th, 5,765,000) is also making another deep Main Event run after having finished 12th in 2011, as is Leif Force (18th, 4,035,000) who finished 11th in 2006. To see the entire final 27, including the seat draw and chip counts, click here. Eliminations came quickly to begin the day, with many watching to see how far Maria Ho — sitting 79th of 79 to begin — might be able to go as the last woman remaining in the field. It was a short day for Ho, however, after Zachary Hurst took the last of her short stack to knock her out in 77th. Ho’s finish marked the second time she’s held the distinction of being the last woman eliminated in the WSOP Main Event, having done so before in 2007 when she finished 38th. Among other early eliminations were a couple of other players who’d performed well in past Main Events. Anh Van Nguyen went out in 73rd ($85,812) after finishing 46th (2004) and 106th (2009). And Kyle Bowker hit the rail in 71st ($103,025) to record a fifth Main Event cash since 2006 and a third top 100 finish. Tony Ruberto began the day eighth in chips of the remaining 79, but a difficult start to day 6 saw his Main Event run end with a 68th-place finish ($103,025), his final hand seeing his pocket eights fail to catch up to Adam Lamphere’s pocket queens. 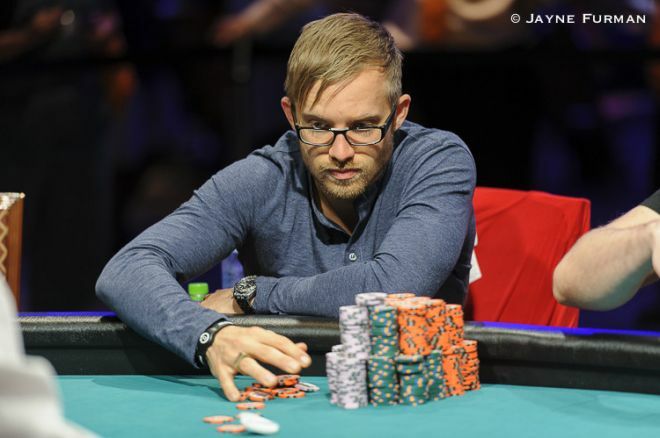 More players fell as they moved through the afternoon, including Brian Hastings (64th, $103,025), Stuart Rutter (59th, $124,447), and 70-year-old William Cole (58th, $124,447) who spoke with PokerNews yesterday about how it was his ninth WSOP Main Event and he was living out a dream by cashing for the first time. Vitaly Lunkin (57th, $124,447), Isaac Baron (52nd, $152,025), Ryan Fair (48th, $152,025), Vladimir Bozinovic (46th, $152,025), and Matt Waxman (45th, $186,388) then followed Cole to the rail before the dinner break arrived. Meanwhile, Kyle Keranen — who finished 38th in this event two years ago — had grabbed the chip lead early be the first player to reach the 10 million-mark, but it was Jacobson out in front with 44 players left with Keranen just behind him. The field would quickly whittle down to 37 upon the players’ return, with David Tuthill (43rd, $186,388), Lamphere (41st, $186,388), and Paul Senter (39th, $186,388) among the fallen. Then with another pay jump coming it would take nearly two hours before Gal Erlichman finally ran into Sindelar’s to be eliminated in 37th ($186,388). During that period Velador would jump in front after winning a big pot worth about 8.5 million off of Keranen to push close to 15 million. But Jacobson would surge ahead again over the day’s final hours, knocking out Luis Assuncao along the way in 34th ($230,487) to push up around the 23 million-chip mark at one point. Garrett Greer (32nd, $230,487) was another late-night casualty, followed by Chris Johnson (31st, $230,487). Then Pappaconstantinou got a huge boost to his stack in a double-knockout hand in which Dong Guo (29th) and Robert Campbell (30th) were eliminated (both earning $230,487) when Pappaconstantinou’s held up versus Guo’s and Campbell’s . Finally end-of-Day-4 chip leader Matthew Haugen was knocked out in 28th after his failed to catch up to Devonshire’s . A new plan had been made to continue down to 24 players, but after a few more hands it was decided to stop at 27 as orginally called for by the schedule. They’ll reconvene at 12 noon PDT today, gathered around the final three tables to begin determining who among the remaining players will be making this year’s November Nine. Once they reach nine players later tonight, the tournament will be on hiatus until November 10th when the final table will finally commence back at the Rio All-Suite Hotel and Casino. During the dinner break yesterday Remko Rinkema was able to catch up with Jacobson to talk about how his day was going as well as about the possible pressure associated with being the front-runner so deep in the WSOP Main Event.